- cosmetics or make-up products can be applied over the protective film created by REGEN-SIL® gel. - prevention and treatment of stretch marks. 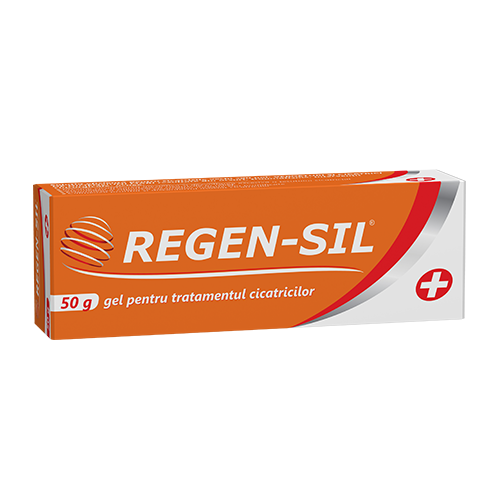 REGEN-SIL®, gel should be administered shortly after the appearance of damaged tissue scarring (usually 2-3 weeks after injury or surgery). Duration of treatment may vary between 8 weeks (for new scars) and 3-6 months (for old scars). For stretch marks in pregnancy, it is recommended to use REGEN-SIL®, gel starting from second trimester of pregnancy and to continue another 2-3 months after childbirth. For other types of stretch marks, it is recommended to use REGEN-SIL, gel all the period when the skin is under tension and to continue another 2-3 months after process ending. Apply a thin layer of REGEN-SIL®, gel to the scar, massage gently and leave to dry. Thus a protective, flexible film is formed, allowing the skin to breathe and remain hydrated. If you have applied too much gel, it will take longer to dry and it is a risk to stain clothes. Gently remove the excess and allow the drying process to continue. A transparent, almost invisible film is formed. It can be removed by washing with soap and water. If the area is washed, repeat the administration for REGEN-SIL®, gel to be maintained in continuous contact with the skin. If you have experienced sensitivity to ingredients, severe tissue inflammation or itching, stop using it and consult a physician. Do not apply to open wounds or third degree burns. Do not use in case of hypersensitivity to any of the ingredients of the product. If the package shows damages that can compromise the integrity of the tube, do not use this product. Do not dispose of empty package in the environment. Store at temperatures below 25°C, in original package. Cardboard box with an aluminium tube containing 15 g or 50 g of gel and instructions for use. REGEN-SIL®, gel is a class I medical device, non-sterile and without measuring function, in accordance with the European Directive for medical devices 93/42/EEC.